Last weekend we had the absolute honour of working on Sam Baileys christening, and meeting the star herself. It was a great experience and the whole day went down a treat with Sam and her kids enjoying themselves to the max. 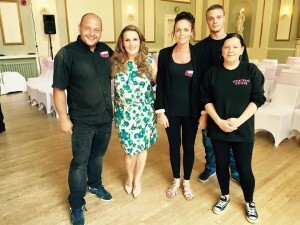 Sam was overwhelmed by our service describing it as “Truly amazing” and she thanked us for all the hard work our events team put into her childrens christening, and commented on what a “professional” job we did! !